"In the year 2050, the United Nations and NATO have been replaced by the United Peacekeeping Force. Freshly recruited to the ranks, you must utilise a range of ground and air combat vehicles (including fighters, tanks and armoured assault vehicles) to enforce peace around the globe." 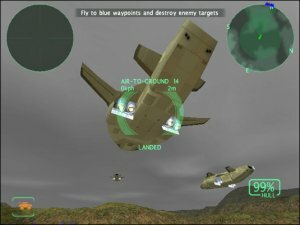 The PS2 doesn't have many real flight sims out there but then came... .Dropship: United Peace Force... unlike most console flight simulators, they feel arcadey and just don't feel right. 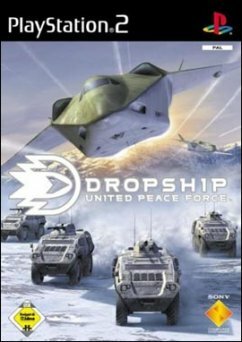 Dropship is the big exception to the genre and is a hybrid between an arcade and flight simulator. The best of both worlds in my opinion. 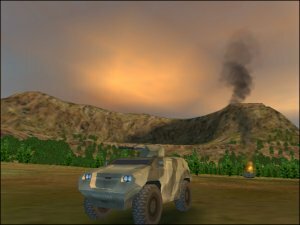 You start the game as the pilot of a futuristic Dropship where you must uncover, fight and destroy terrorist movements to protect world peace. The dropship technology lets you fly at unbelievable speeds or hover like a helicopter. 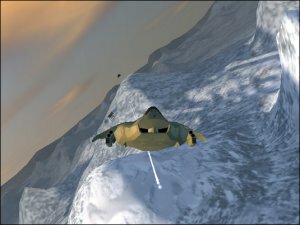 The graphics are truly outstanding and you really get a feel of flying through valleys and deserts. The lighting, water effects and terrain could not be better even if they tried. Even the little things such as troops running on the ground are animated well. The controls are a little bit fiddly at the start but once you've done the training and completed the first few missions, it will become second nature to you. I still get a real buzz of pushing the afterburners as the controller vibrates, giving you a real sense of g-force. Its a really nice touch to the game. The music is non-intrusive and the sound effects are top notch. However, it should be noted that the speech is what truly adds realism to the game with a combination of British and US voice actors. Remember the Death Star trench scene from Star Wars? Thats basically what the game offers with its speech. For an instant, I thought I was flying an X-Wing instead of the powerful Dropship. The game has an innovative mission structure that eventually unravels into political intrigue and lets you, the player take command. I highly recommend this game and I'm still having a blast playing this. Go and buy it now!